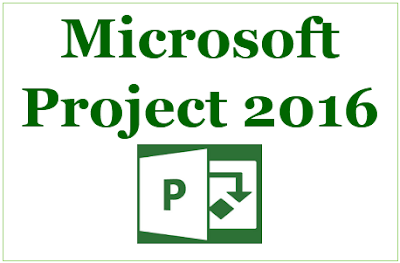 MANAGEMENT YOGI: Microsoft Project 2016 Preview – What is New? Microsoft Project 2016 Preview – What is New? Yesterday the new version of Project 2016 was released for preview. The download link is here. Good to see Microsoft continuously engaging with and upgrading this software, which is quite popular. I was trying it over this weekend and spent couple of hours on it today. It has certain new features. Here, I’ll be talking of some of the new features available in MS Project 2016 after my quick check on the software. The default theme has changed - called “Colorful”. It gives a new look and feel. With this the top bar color changes. 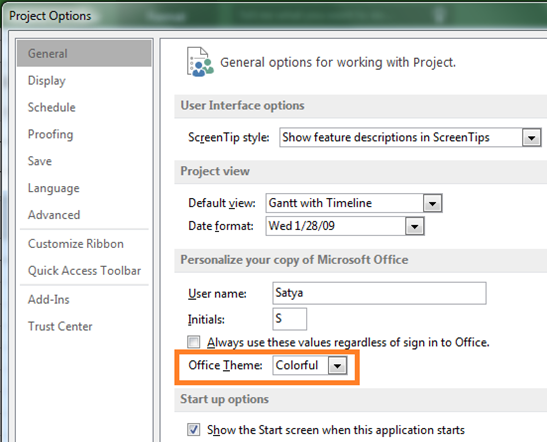 If you want to change the theme to the previous color of 2013, you can change with the office theme to “White” or something else. This is a new feature not only in MS Project 2016, but in other office apps such as Word, Excel, also. There are many commands in many tabs (under which many groups) in MS Project. Imagine a new user or even sometimes an experienced user, who is lost in the maze of commands given in MS Project. With this you can quickly find out the command that you want to have and use it. I find it useful. As shown above, a query box “Tell me what you want to do…”, is available on top of the ribbon with a bulb icon. You can type in what you want to have to and MS Project will list out possible and related answers to you. 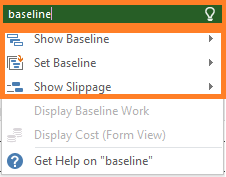 It is also useful that you can directly open the baseline dialog box or show slippage directly from here. For example, if I am selecting “Set Baseline” above, then it lists out some more along the way. The tool tip text shows you what exactly the command would be doing. After you have used it, some frequently listed commands can be shown. The buffer is having 5 recently used commands. This is another new feature in MS Project 2016. To have the Timeline view, you have to enable the checkbox: View tab -- Split View group -- Timeline checkbox. Earlier, you can add only one timeline bar. Now multiple timelines can be added. You just have to click on the “Timeline bar” command under Format group. Below, I have 3 timeline bars after clicked 3 times on the “Timeline bar” command. Of course, you can remove them as well by right clicking on the selected bar. This feature is useful. How? In the project below, I have shown 3 timelines: first one with L1 and L2 activities. For next two, there are further extension of L2, and goes to L3 and L4 if needed. Further customization can be done on it. Shown above with minimal checking. 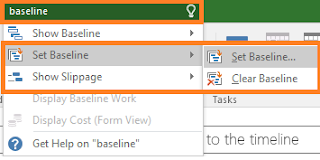 This feature also will be useful if you are managing multiple projects with MS Project 2016. One can set the date range by selecting the command in the Format tab -- Show/hide group -- Date range command. 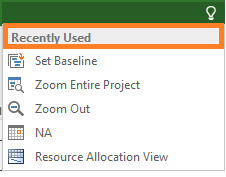 Note: I understand other new features will be available in MS Project 2016 such as Resource Engagement functionality. I believe the upcoming MS Project 2016 software will be better as compared to MS Project 2013. Have the feature “Tell me what you want to do…” configurable so that the user can choose what are the 10/15 most used commands and that can be frequently accessed. It is already there for archive projects (default upto 25) and number of recent projects (default value 4) from Options -- Advanced -- Display. Any comment is welcome - comments, review or criticism. But off-topic, abusive, defamatory comments will be moderated or may be removed. 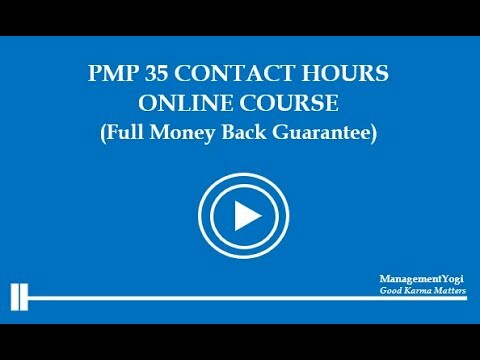 Book for CAPM Exam Prep: "I Want To Be A CAPM"